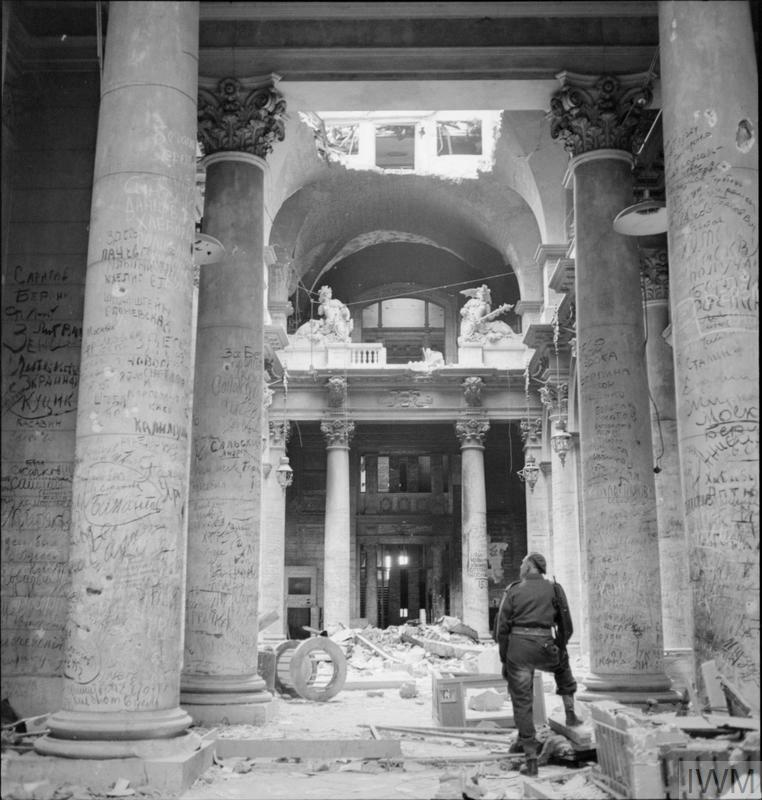 After the end of the Second World War, the Allies brought the leading civilian and military representatives of wartime Germany and Japan to trial on charges of war crimes, crimes against peace and crimes against humanity. The principles of the trial of the Nazi leadership were agreed at a meeting of the ‘Big Four’ – Britain, the United States, the Soviet Union and France – in London in the summer of 1945, resulting in the Nuremberg Charter. The Tokyo Charter similarly laid out the principles and procedures of the trial against Japan’s leaders. It was largely the result of an executive decree by the Allied Supreme Commander, Douglas MacArthur, acting on instructions from the US Joint Chiefs of Staff. Eleven nations were represented in the prosecution team, including Britain, Australia and India. 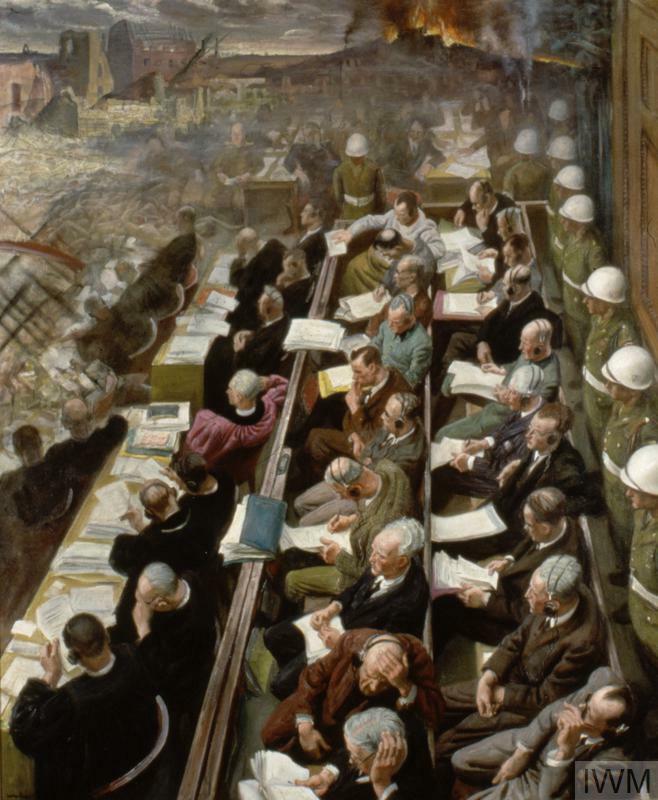 The Nuremberg Trial, 1946, by Laura Knight. Artist Laura Knight gained special access to the broadcasting box just above the defendants, where she was able to make charcoal studies of the main protagonists amongst the lawyers and the accused. Knight was deeply disturbed by what she heard during the trial, and the painting shows a landscape of desolation floating above the courtroom like a shared nightmare. The International Military Tribunal at Nuremberg was in session from November 1945 to 1 October 1946. Twenty-two leading Nazis were tried, including one in his absence. Twelve were sentenced to death by hanging, seven to terms of imprisonment and three were acquitted. Hermann Göring committed suicide the night before his scheduled execution. The International Military Tribunal at Tokyo sat from 3 May 1946 to 4 November 1948. Twenty-eight defendants were tried, of whom seven were sentenced to death by hanging and 18 to terms of imprisonment. Two of the defendants died during the trial and one was declared unfit to be sentenced. 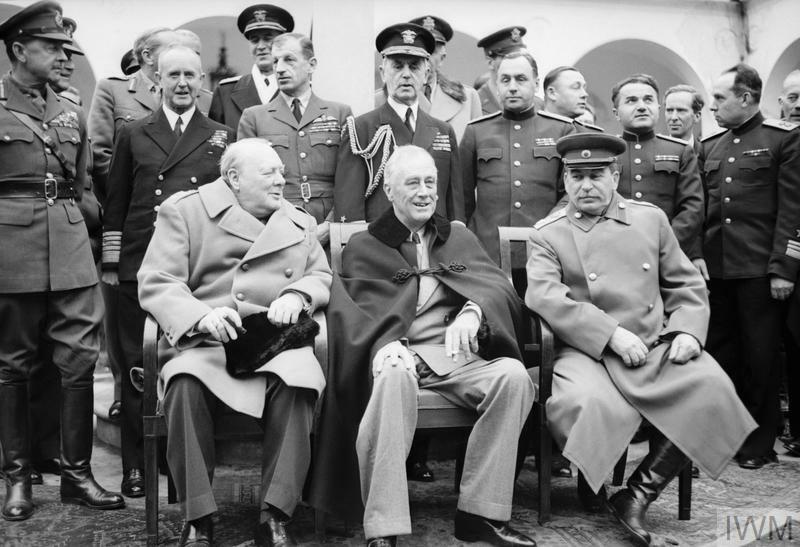 Yalta, a seaside resort on Russia's Black Sea Crimean coast, was the scene of the second and last wartime conference between the 'Big Three' Allied war leaders, Winston Churchill, Franklin D Roosevelt and Joseph Stalin between 4 and 11 February 1945. What Happened After VE Day? On 8 May 1945 millions of people across the world celebrated Allied victory in Europe. But VE Day did not signal an end to the Second World War. Allied servicemen who had fought their way through Europe prepared for their transfer to the Far East and the Pacific, where fighting would continue for three more months. The Holocaust was the systematic murder of Europe's Jews by the Nazis and their collaborators during the Second World War. For the first time in history, industrial methods were used for the mass extermination of a whole people. Between 1933 and 1945, Jews were targeted for discrimination, segregation and extermination.